HubSpot allows you to set up dynamic content areas for both known and unknown visitors. When you have visitors from different georgraphies, you may want to use smart content to tailor your content based upon their location or language. Smart content by country uses the visitor's IP address as the basis for their location, whereas smart content by preferred language uses their preferred browser language. Smart content by preferred language will generally be more accurate than country at determining the language that content should be served in. In the content editor, mouse over the module that you would like to make smart and click the smart icon overlay. 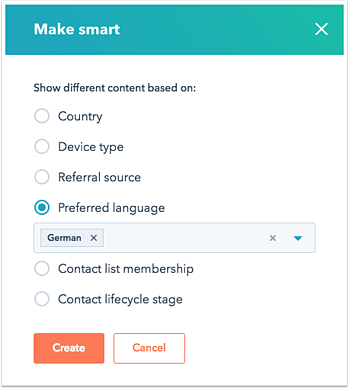 Choose the Preferred language radio button, then use the dropdown to select the language or the language-locale combination that you would like to create the smart rule for and click Create. You can select more than one language per rule. Enter the content that you would like to render for that language's rule, then click Save and go to module list in the lower-left corner. You can use the Content dropdown in the module editor on the left-hand side to toggle between your default content and your smart content, or to add, delete, or to modify your smart rules. After you've finished updating your content, click Publish. Click on a module in the layout editor to select it in the inspector, then click More > Make module smart. Edit the default content for the module that you would like to render for that language's rule. In the inspector under the Default Content section, you can use the Smart based on preferred language dropdown to toggle between your default content and your smart content, or to modify your smart rules. After you've finished updating your content, click Publish changes.